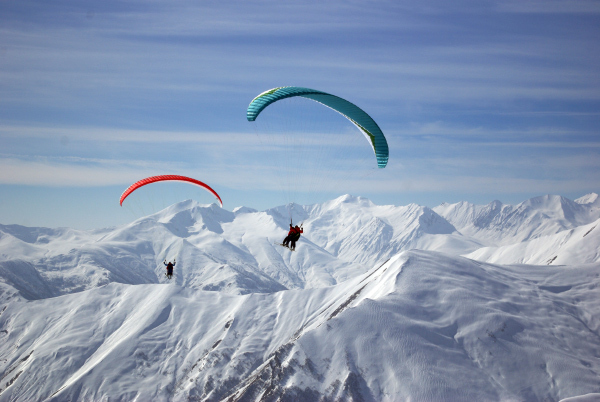 Fly Caucasus offers the best tandem paragliding site in Gudauri, if not the South Caucasus. The spectacular views and stable weather conditions puts it right up there. From the perfect take off sites close to the spots around Gudauri, your flight will take you over the ridges with a birds eye view of the places above one of spot. After a 15 to 45 minute flight, you will smoothly land close to the takeoff area or near road in valley after cross country flight. We've been paragliding in Gudauri since 1999 and have huge experience in local weather conditions (year round). Also we are the only company with its own devices and equipment for monitoring weather in Gudauri. This allows us to choose the best and safest time for your first amazing experience. We have been flying in Gudauri every day year-round. At Fly Caucasus we have a proven safety record from day one which we credit to our staff, professionally maintained and certified equipments and company procedures. Our certified and 10 to 15 years experience professional pilots fly up to five times per day, every day, taking people like you: male, female, young and old on this amazing adventure. Each passenger is briefed and equipped with helmet and flying suit, all pilots carry complete reserve and communication systems, weather conditions are carefully assessed before we take you up and again on take off. You are assisted by our crew on both take off and landing. There also might be a shift of your paragliding time from morning to evening or vice versa due to safety issues. It perfectly fits to one-day tours to Kazbegi that we provide via advance booking and coordinate on our own. It allows us to use your time efficeintly and make sure that you have the maximum of your tour and flight. For all the reasons above we ask you to book your flight on our website in advance. Online booking is a guarantee of your safe and pleasant vacation in Gudauri. After your free booking we will advise the best day for your first experience! After a short explanation you and your pilot will take off from a mountain slope under a canopy that resembles a parachute. Once inflated overhead, you will take just a few steps or a short run to take off from the gentle slope, the wind will catch the canopy and you will be airborne. In the air complete control over direction and speed gives your pilot the freedom to soar ridges, rise on warm currents of air and cover distance. All you need to experience this amazing opportunity is comfy clothing by weather season. We advice to bring jacket, pants and footwear like thick shoes or winter boots (required from October till April). Bookings are essential, do not leave it until your last day as we are dependent on the weather conditions.